This eyeshadow trio appealed to me because I liked that the colors could theoretically work well on their own or together with the others in the pallet. 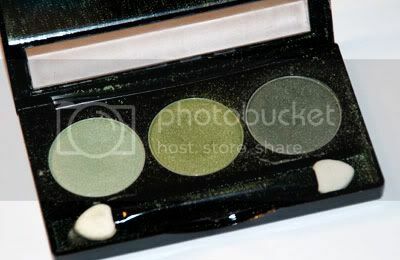 What I discovered when I tried it for the first time was how creamy the shadow was, yet it still was a powder shadow. The powder just glides on and has a long lasting staying power, without clumping on you later in the day. I really like that I can mix and match the shades and it always seems to work out. I don't think I have ever had this experience with a trio or quad set before. You've inspired me to shop again. Darn! (yeah, right). You've inspired me to shop again.